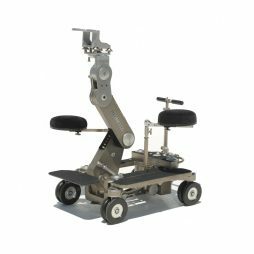 Chapman/Leonard’s industry standard, grip-favourite Super PeeWee MkIV Plus is the perfect dolly to take your production to the next level. The PeeWee MkIV allows you to make quick camera position adjustments without having to waste time with a multitude of rig changes, saving time on set and money on production. Chapman/Leonard’s tried-and-tested camera dollies are all smooth and reliable, allowing your crew to hit their marks each and every time and our PeeWee MkIV Plus kit continues this tradition. Featuring a full compliment of accessories , your grip will be able to make your camera dance. The Super PeeWee MKIV dolly is supplied with Chapman/Leonard’s a fully-racked accessories trolley as standard.